Fun Art Classes for 2 and 3 Year olds. The focus is on achieving Child Development Milestones including fine motor, talking and understanding, social and intellectual skills. Parents interact with their children in the art making process in the class. In our class for 4 year olds (Kindy age) we work on building fine motor skills in preparation for school. Children experiment with various art materials such as paint, pastels, collage and clay. Parents are encouraged to remain in the room with their children. 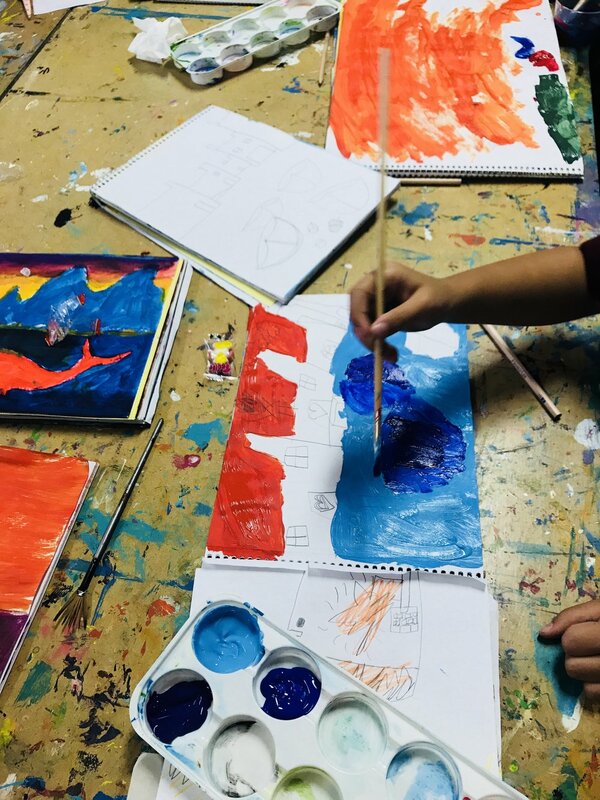 Fun Art is designed for children in Prep and Year 1, we start the year very relaxed and use the sessions to de-stress from the demands of school. Children learn the studio habits of mind while designing, creating and reflecting. Parents do not stay in the studio. Creative Wings is open to children currently in Grades 5 or 6. Students learn complex art concepts, skills and techniques to challenge their understandings of art and prepare them for high school. Children explore art history, drawing, painting and ceramics during the year. Studio Teen is offered to high school students in Grades 7 - 12. Teens are encouraged to utilise all studio resources to develop their creative expression and are welcome to bring in school art assignments for guidance. Students work individually on their own artistic interests and are given one-on-one assistance. Studio Adults is open to complete beginners to established artists. If you have never touched a paintbrush before (or since school days) this class is for you! Individual explorations in drawing, painting and ceramics are welcomed in Studio Adult classes. Our classes are relaxed, fun and will leave you with a smile on your face! Looking for a space to host a party, work team building event, or mother's group meeting? You can book the studio during non-class hours to use the space for your needs!